Bangladesh Engineering and Construction Corporation Ltd – BECC Job Circular 2017 has been published by the authority. Jobs resignation of BECC is many categories. It’s a huge opportunity to unemployed people, Who want to do in this sector. BECC is one of the most valuable construction company in our country. With the job chances in BECC, anyone can take this opportunity. 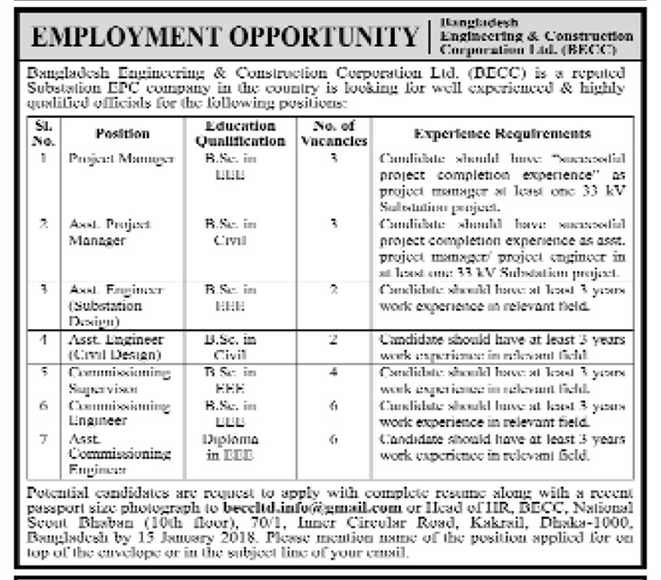 To get Bangladesh Engineering and Construction Corporation Ltd – BECC Job Circular 2017 related information, you can visit jobs.lekhaporabd.com. BECC is a workplace where important tasks are mastered as a team. It is a workplace that offers you outstanding prospects and opportunities for development. Your individual growth is especially important to us. They want you to develop your full potential and achieve their business objectives together with you.